I have big plans. I will take a sabbatical from work and do this tour without flying – the band have been blogging on their new W.A.S.T.E. Central platform about how they’re trying to reduce the carbon footprint of touring. Encouraging people to use public transport to each the shows, offering incentives, publishing a report on the impact of their previous tour. As it turns out, I become an expert in Eurorail-booking sites, Irish Sea ferry crossings and being desperate for a decent cup of tea. It is entirely possible to follow a tour without flying if you have the time to spare. With foresight and my skills as an online booking ninja, it’s actually marginally cheaper as well. It turns out I’m the only person who is excited about this. Everyone else still has to squeeze the shows in at weekends but I turn my summer over to the Radiohead trail. Anticipation is part of the adventure. Three months of planning and decision making – to me almost as enjoyable as the actual travel. I keep track of everything, becoming a train-bore. I keep waking up early in a panic. Doing this feels like a momentous decision (but it doesn’t really work out that way). As always the uncertainties seem important at the time. Will all the tickets turn up in time? Will I be able to blag into the London shows? Will there always be somewhere to sleep? I should be more ready for spontaneity. The internet doesn’t quite work well enough yet. (In a couple more years these things will no longer be problems and I’ll have the internet in my pocket, a smart phone that actually works). There are no real incidents on the way, apart from the odd missed connection and occasional unscheduled taxi rides (the world is still not designed for the solo non-driver). In Ireland wi-fi has yet to become as ubiquitous as it has in the UK and I find myself hunting out old PCs in internet cafes. It is harder than I anticipated to write about the shows coherently. I find myself writing about travel, which now seems mundane. Being a bit sleep deprived and taking a few trains doesn’t read like exploration and there is nothing luxurious or exciting about the Glasgow to Belfast ferry connection. I rendezvous with Gabi at a B&B in a village near Malahide for the first gig at the Castle. It’s a long slow queue through the woods, we’re going on a Radiohead hunt. Familiar faces are spotted in the trees and eventually, we pour into the huge field where the show will take place as Bat for Lashes takes the stage. They are either going to grow on me or I’m going to be heartily sick of the Bjorkish mannerisms after a couple of shows. The weather held until just before Radiohead came on stage then light showers split the sky. Time to pull out my rain hood (pocket size, like old ladies wear, given to me as a joke, but actually quite handy as it means I can keep relatively dry, yet still see the stage. 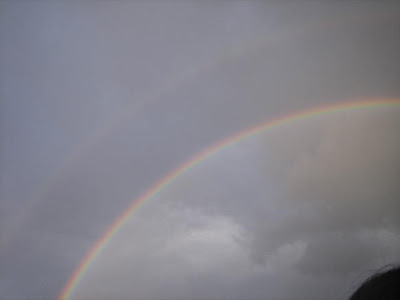 And what would you know, a rainbow and then a double rainbow… if it had been planned it would have been cheesy. For such a big show, it is a really polite crowd, everyone in a great mood, being considerate but also getting into it. I spend the whole show with an enormous grin on my face (apart from Pyramid Song which reduces me to tears). The band are in extremely good spirits, it doesn’t get dark until gone 10pm, so for most of the show the band were responding to waves from the crowd and it looked liked there were able to spot of lot of the familiar faces. They play mostly In Rainbows stuff and a few oldies in the encores.. they barely touch OK Computer but still manage to play 29 songs. I felt really connected in this show, it doesn’t always happen, but when it does I know this is the reason I keep on coming to see them. It was a joy pretty much all the way through, a great view. A couple of guys behind me had come all the way from Israel for their first show. I was surrounded by a plethora of different European accents. When I finally give in and clamber out to go to the toilet in the encore break, the crowd let me back in and I join some friends a bit nearer the front. A thoroughly satisfying experience and we get to do it all again tomorrow. Getting back to the B&B was a bit of a challenge but we eventually got a cab and shared with a French couple who were going in vaguely the same direction. The next morning the breakfast room is full of people sporting their new recycled Radiohead T shirts.